Daily Kashmir Link on of the premiers, Prestigious, and largest circulated Daily Newspaper. It is publish simultaneously from Muzafarabad, Islamabad, Lahore and Landon. It was established in 14th August 2012. The mission of this newspaper is Link and a source of communication between Kashmiri People by this newspaper. It was started from the Muzafarabad after that new editions start from the Lahore and Islamabad. 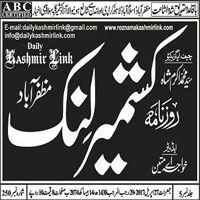 The chief Exective of Roznama Kashmir Link is Syed M.Akram Shah and Chief Editor is Syed M.Asghar Shah. Syed M.Akram Shah is one of the famous Former law secretary. Daily Kashmir Link delivers Current News, Breaking News, Latest News and top headlines in Urdu language from Pakistan, Kashmir and categorize as World, Sports, Business, Politics, Cricket and Weather. It brings Columns, News videos and Entertainment News.